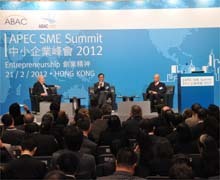 Starting a business, and making it work, was the key focus at this year's APEC SME Summit, held last month in Hong Kong. An innovative Hong Kong company has stepped out into the world of healthcare, coming up with specially designed shoes to protect diabetics. In what's seen as a breakthrough for the international film industry, China plans to raise the quota for foreign movies allowed into the country. The move is being hailed by industry insiders, including in Hong Kong, as a win-win. Beyond luxury, there’s a huge China market to be tapped in the premium fashion sector. Hong Kong’s Sidefame is proving that, launching Japanese label Atsuro Tayama on the mainland. Don't miss the region's leading fair for the home textiles industry, happening in Hong Kong next month. Preliminary statistics show that spending in Dalian's domestic services market is rising into the hundreds of millions of renminbi.